Open Tuning: The original blues players were largely self taught (and many of them illiterate), and one of the easiest ways to create different chords was to tune the guitar to an open chord, such as G major or E major, and then use a metal or glass slide (a pocket knife or bottle neck) to change chords. Picking style: In both slide and fretted guitar styles, guitarists would emphasize the driving rhythm of the blues by thumping out steady bass notes on the low strings with their thumb while in turn, or simultaneously, finger-picking upper strings to sound out chords, melodic riffs, and fills. Using Slides: Playing simple chords to back up a blues singer is still a form of blues guitar — as is playing chords with a slide. You can’t help but sound bluesy when you move a slide from one position to another to play the different chords in a song — especially if you do it expressively. Chord Progressions: What defines a blues song is the way chords are put together, or the chord progression. Although there’s no such thing as a blues chord, if you put certain chords together in a certain way, you can definitely create a blues chord progression. The most common blues progression is the 12-bar blues. Blues Triads: Chords used in blues include major and minor triads (simple, three-note chords), dominant 7th chords — triads with the flatted (lowered by a half step) 7th added — and sometimes even jazz chords with complex-sounding names like G13 b9/b5. 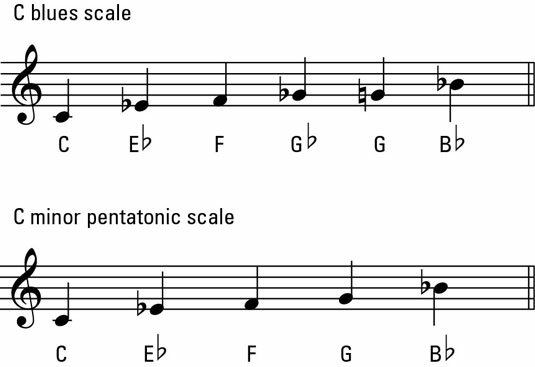 Blue Notes: The blues definitely has a harmonic and melodic language, and even a scale named after it: the 6-note blues scale. If music is described as “bluesy,” it usually means that the melody borrows or enlists notes from the blues scale (nicknamed “blue notes”) rather than the standard major and minor scales that make up other, non-blues styles. Blue notes are the minor third, minor seventh, and flatted fifth (in shorthand, those notes are b3, b5, and b7). When playing the blues, guitarists incorporate aspects of both the major scale and the blue notes to come up with two new scales of their own: the 6-note blues scale and the 5-note minor pentatonic scale. The 6-note blues scale and 5-note minor pentatonic scale.